Oldest one at the top, newest at the bottom of the photo. I bought a new berimbau during last week’s event. My fourth one! My very first one was given to me by my husband, for my birthday in 2011, with a cabaça media (medium). The verga is very heavy and solid – I can’t really play it for longer than 10 minutes at a time. It does, however, have a beautiful sound. It’s hard to arm too, because the wood is very dense but I manage with some considerable effort. Then, in 2013, while we were in Brazil, I got a really light, bendy one (2nd from top on the photo), during a Capoeira event, along with a most excellent waterproof berimbau bag. Sadly that one seemed to be cracked, I only realised later on. I tried to mend it with super glue and string, but I made it up as I went along and didn’t know the proper way of doing it – and it just never sounded very good. 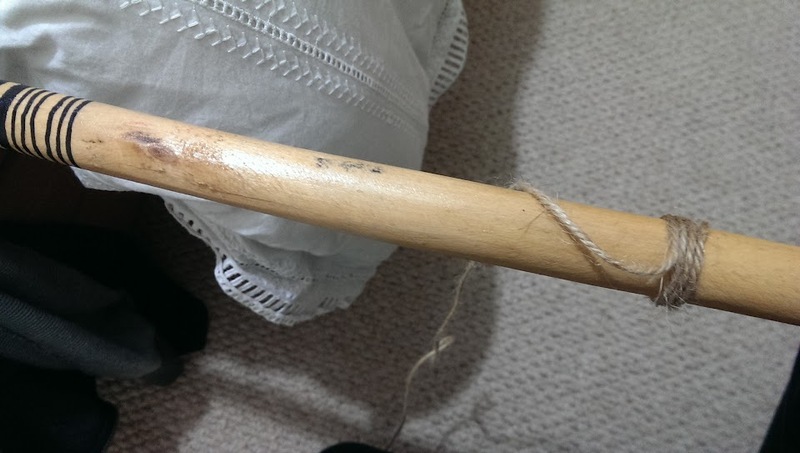 It’s a very light berimbau, very easy for my lightweight arms to arm, so I have been using it a lot since my left hand injury, because holding the berimbau hurts, so I need something light if I want to play for an hour (this is how long our music lessons last). Last year, on a whim, I got one from a German website (Kalango), along with a viola – it’s pretty adequate and it does the job, on the heavier side, and tough to arm too. So… I didn’t really need another berimbau did I? But I’m starting to realise that you can never have enough of them 😀 I have a berimbau addiction. I got another medio cabaça too, because the one I had was too open. I had it for about a week and this is by far the hardest one I’ve had to arm. It’s of medium weight, between the lightest and the heaviest berimbaus I have. I took it to music lesson twice and on both occasions I had to ask someone to help me arm it. It was yesterday, when I was trying to arm it myself and failing, that I heard it crack!!! It didn’t fully break, just a minor fracture – so perfectly fixable. 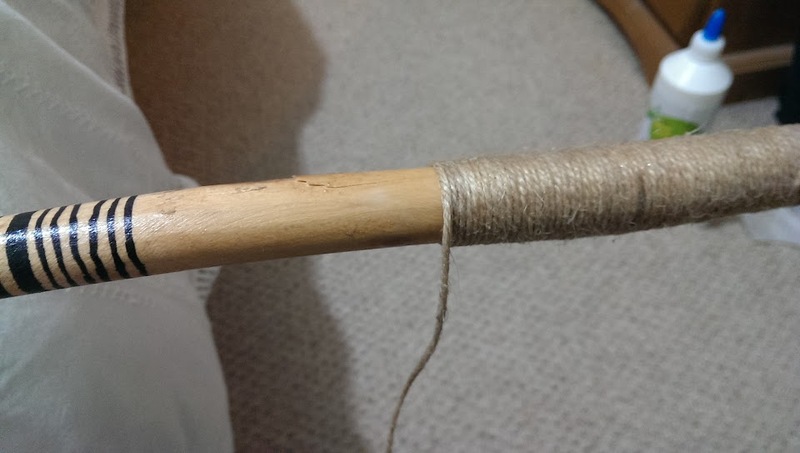 Once that’s dry, in about 5 minutes, wrap the string around – best way to do this, I found, is with it standing in a vertical position, then rotating it while tightly holding the string in position. Put the PVC glue either on your hand or the string and distribute it evenly. As you get to the fracture, do another few loops with superglue. Once the superglue has dried, then continue for another 10cm. The mistake I made when fixing my other one was to think that I only needed string in the close area around the breakage. Finish off with superglue on the last few loops. I was on a row so I fixed the one I got in Brazil too. A very enjoable process… I quite like the look of the string wrapped around like that. I’m waiting for 24 hours before I attempt to arm it again – but the string was pretty dry after a couple of hours.